Perfect love casts out fear. The enemy whispers, “If the Father really loves you would He allow this in your life?” But when we know the Father’s love for us, we cast the lies of the enemy right back to the pit of hell and we walk in freedom. I am praying for us today that we would no longer allow the enemy a foothold in our thought patterns. I am praying that today we would choose our thoughts well and if any thoughts contradict the word of God and His truth that we would no longer entertain them. It takes a purposeful person to overcome negative patterns but I know you and I can do it. I know we can stay out of the pit that slowly eats away our souls. God has enabled us already! 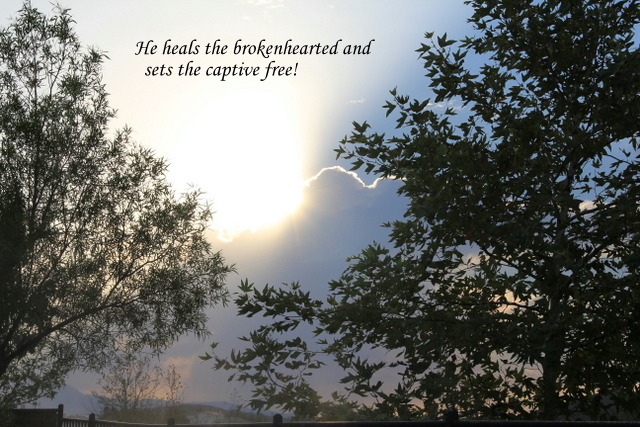 He has come to set the captives free! We are free indeed!